For those who haven't heard yet, there is an ongoing protest in New York. 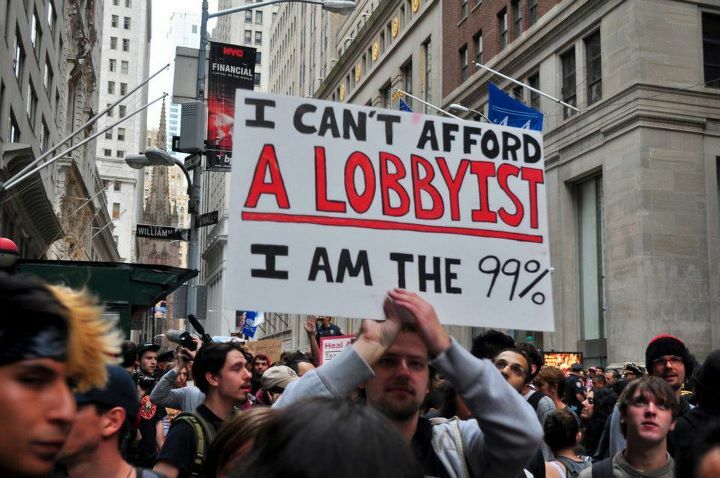 Wall Street has been over run by what was originally a strange amalgamation of angry citizens, anarchists, techies and political activists has now become a massive nation-wide movement including various professional unions, artists, prominent thinkers, patriots and various established organizations. This has been going on for 14 days with amazing coverage on the ground from bloggers and the movers and shakers. What is truly interesting to me is what the meanings are behind these movements. 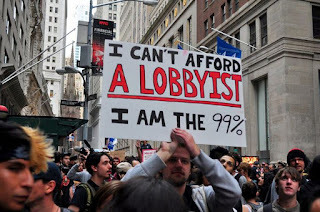 This current movement seems to be a reaction, in some way, not only to the inequalities in representation that we in the 99% feel in Congress compared to those who have lobbying firms and monetary influence. The reasons for individuals taking to the streets also seem to be a reaction to the anger we are all feeling at the bailouts that Wall Street have received while still down grading the status of our economy and trust. They are pissed off about bank foreclosures, high unemployment and the state of the Nation. In my mind, while this movement has definitely been inspired by the Arab Spring, this is also a reaction to the Tea Party movement. Back in June the Washington Post ran an article called; "Can Liberals Start Their Own Tea Party?" - In it it described Van Jones' "The American Dream Movement"
While the occupy Wall Street movement is not solely a liberal push, it is a movement wanting change, change from the old norms of economic ideals and the concept of "too big to fail." When Republicans are admonishing President Obama for his tax plans being "class warfare" they should look at what is happening in New York; that is the true starts of class warfare. This is the Network moment. The people are mad as hell and don't want to take it anymore. There are many voices in this movement. Some who are outraged by the current failings in Congress and our economy and some who are just tired of our floundering and insane economic system of investment and monetary tricks. What we also have to keep in mind is that for the first few days of this movement, it was silent. Most are upset during the first week of this movement that there was very minimal press coverage. Either the media didn't want to address this "protest movement" or they didn't really know how. It got to the point where the story of the lack of coverage got more coverage than what was actually taking place and what it meant. Then the protests got violent, not on the side of those who were angry and expressing that angst through their constitutional right of peaceable assembly, but from those "keeping the peace." Many had been arrested and tensions rose. One instance that shocked me was a group of young women, in a fenced off area, standing peaceably being non-nonchalantly pepper sprayed by an officer of the law. Different organizations have picked it up, even more than instances of brutality or [updated] protesters marching on the police themselves. Well, Dr. West, it has started spilling over to San Francisco. In fact there have already been at least 6 arrests in San Francisco durring protests that sprung up on this side. It seems the current Zeitgeist. Billionaires and millionaires taking Warren Buffett's approach and asking for their taxes to be raised, the disappearing American middle class, the horrible state of things out there. The people are tired of being marginalized and are trying to fight back. While some may try to minimize the importance of these droves of individuals taking to the street, and others hail it as the start of an American Communist revolution, I sit and enjoy the moment. No matter what happens here, we the American people are trying to change a broken system and I am getting tingles seeing it happen. For more about the protests and other FAQs, The Nation has a really great article up here.